Those gardens which please one far beyond expectations always make for an especially enjoyable day. This is how it was with Abbeywood Gardens near Chester in England. It is not the biggest of gardens one might visit; it is not as well known as other gardens in the area but I enjoyed it far more than the others in that area. 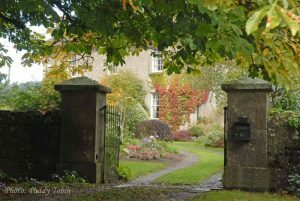 It is a garden of several areas, each with its distinct character, flavour and planting palette. Some of the areas are a redevelopment and revival of parts of the old garden while the owners are showing ambition and vision as they extend the gardens with flair and great planting. The house is off centre to one’s visit as the entrance is via a relatively newly constructed area which houses what is obviously a very popular restaurant – a restaurant which is uncommon among garden restaurants in that it also serves beer etc. and this was most welcome on the scorching hot day on which we visited. The owners have diversified further as they have a licence as wedding venue and a wedding was planned for the afternoon of the day of our visit – we didn’t wait to witness it. I’m beginning to feel I am writing in Tripadvisor with such comments on the restaurant heading up my comments – I was amazed when researching gardens for this holiday, and visiting Tripadvisor, at how often the first comments on a garden were on the quality of the cakes available. Oftentimes, the gardens were only incidental to the afternoon teas. However, this garden happens to be an excellent garden with an excellent restaurant – a winning combination! Everybody happy! The Exotic Garden is immediately after the restaurant garden/outdoor eating area and is very much in the mode of the modern fashion for lush, large-foliage plantings to give a jungle effect. To emphasise the jungle atmosphere, the planting was dense and with great height so as to give one the feeling of being enclosed and surrounded by plants. Though it is a style which doesn’t appeal greatly to me I felt it was well done. The Chapel Garden was a contrast to this with more openness , more sparse planting, a feeling of calm, quiet and gentle formality. 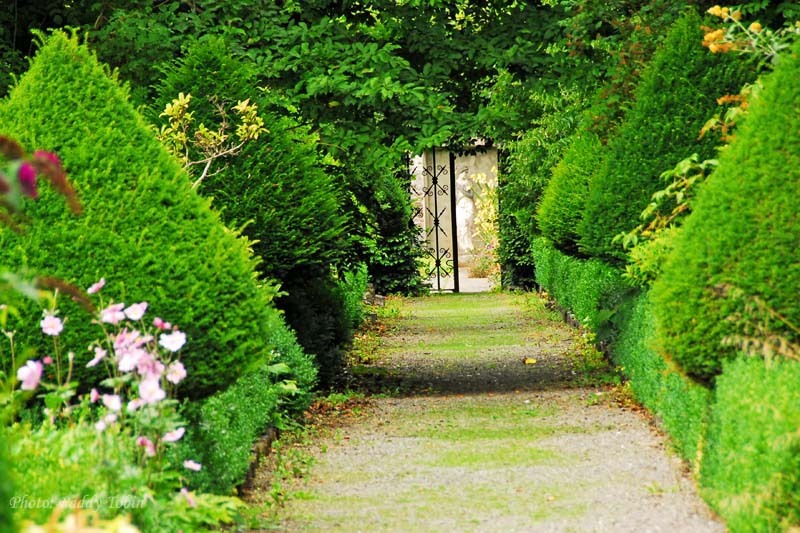 It was an excellent introduction to The Pool Garden which enclosed by tall, well clipped yew hedges, herbaceous borders enclosed in box hedges and all around a long rectangular pond with herbaceous. It was a classically simply design, well implemented, well planted and well maintained. A wooden bridge had been placed across the centre of the pool in line with an axis from the entrance to the newly developed herbaceous borders and I felt it was a pity it was put there as it interrupted the view and reflections of the pool. It may have provided visitors with a short-cut through the garden but the intention of the original design was to enclose the visitor and bring them around the garden around the garden rather than passing through it. Twin red brick piers framed a view from The Pool Gardens to the new herbaceous borders and onwards to open countryside but it was only on passing through this gateway that one realised a beautifully planted pergola ran to left and right behind the yew hedge of The Pool Garden and that it had a fabulously planted herbaceous border running parallel along its length also. The Herbaceous Border with The Pergola behind. Immediately in front there was a new double herbaceous border leading to The Prairie Garden, an area of large scale planting mixing herbaceous plants with grasses. It has been an excellent success with impressive size, bold planting and a wonderful feeling of openness and integration with the surrounding countryside. The Prairie Garden – and following images. The area around the house is of a very pleasing domestic scale and wonderfully blended and integrated with the architecture of the house itself. There is an area of woodland to one side of the house which is being cleared of rough undergrowth and this promises to be an interesting garden in coming years. All in all this is a garden where a huge amount of work has been done in recent years and there is every sign that this work is going to continue and that the garden will continue to improve in quality and interest for the visitor. The house with its tastefully planted surrounding areas. The final stop in the garden was to the restaurant and that most welcome glass of beer – a perfect ending to a most enjoyable visit.